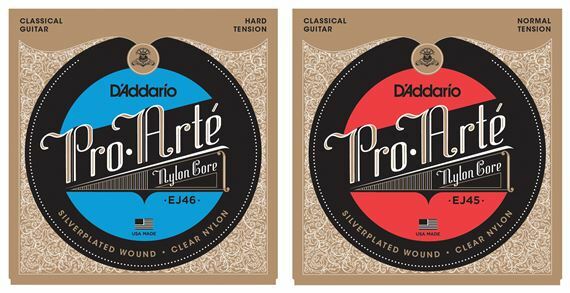 Shop D'Addario EJ45 Pro Arte Classical Guitar Strings Normal P028-43 from AMS and enjoy Fast & Free Shipping. I'd like them better if they did not use silver. Shopping around for an alternate brand. After putting new strings on they stay in good tune after around the 15th time. None have broken and sometimes they are flexed big time. Makes unique sound depending on how hard or softly they are flexed. The E,A,D strings tarnish, but wipe clean with soft cloth. ProArte strings are some of the finest you can buy, at a reasonable price. They produce excellent tone on my Alvarez Yairi CY140 and have longer-than-usual life, compared to most other strings. I have used several sets on my 3 nylon-string guitars-and have never had a broken string. Great classical tone. Get the High Tension EJ46's-they have the best sound and dynamic response. The only strings I have tried with better tone (marginally) are Savarez high tension-but they're more expensive. Srings look good. Were recommended to put on a basic Yamaha beginner guitar. Like the feel of the strings.